Place all of the ingredients in a food processor. Pulse until you obtain an even mix. If the mixture is too dry, add 1 more tablespoon of olive oil. Divide the mixture into 10 equal parts. Form balls using your hands and then lightly press to obtain disk-shaped nuggets. Heat enough oil over medium heat until it reaches 350° F. Fry the nuggets until they are golden on both sides, which should take 2-3 minutes. Place on a plate with paper towels. To prepare the yogurt sauce, place all of the ingredients in a small bowl and mix until everything is combined. Serve the nuggets with yogurt sauce. If you don’t have chickpea flour, you can use all-purpose flour. Chickpeas are my favorite type of beans and I like to prepare them in salads, soups, stews and nuggets. 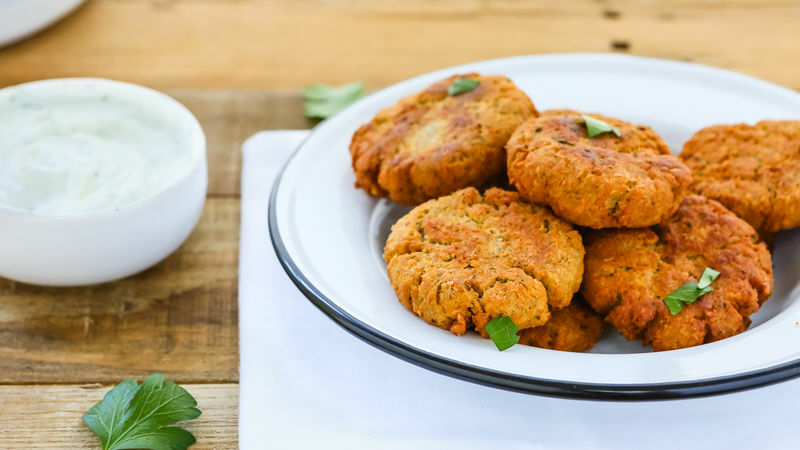 So, if you like chickpeas as much as I do, don’t wait to prepare these chickpea nuggets… You’re going to love them! In addition to being very tasty, they are very easy to prepare. Serve them as a side-dish with any meal or put them in pita bread, with a bit of lettuce, tomato and yogurt sauce for a quick and delicious lunch.